The unique position, overlooking a beach of fine white sand in the heart of Golfo di Marinella, is the pride of the Hotel Abi d'Oru, the only 5 star hotel in the area to have this privilege. 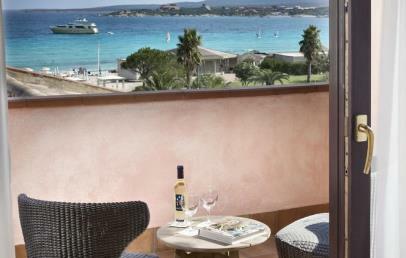 An elegant hotel, located just 4 km from the famous Porto Rotondo and approx. 16 km from Olbia airport. The Hotel Abi d'Oru is characterized by spacious porches and terraces, in perfect harmony with the buildings of the Emerald Coast. The hotel is set in a fragrant and rich Mediterranean garden, leading down to the beach and the crystal blue sea. Many of the 150 rooms of the Hotel Abi d'Oru have sea view. The decor is typical from Sardinia with warm colours and modern/traditional furniture. Standard – approx. 18-25 sq.m., with balcony or patio with view over the hills, garden or lateral on the sea. Superior – approx. 18-25 sq.m., with balcony or patio with direct access ont the garden, view over Gulf of Marinella. Deluxe – approx. 15-28 sq.m., completely renewed; they can be on the upper floors and have balcony with sea view; or on the ground floor (Garden Deluxe) with partial sea view and direct access to the garden. Junior Suite – approx. 30-40 sq.m., an open space room with living corner, terrace or patio overlooking the Gulf of Marinella. Family Classic room – approx. 40-50 sq.m., two separated rooms (bedroom and living room), small terrace with partial sea view. Presidential Suite – new Suites, with master bedroom, second bedroom, living room, two bathrooms, nice terrace and marvellous view over the bay of Marinella. VIP services. 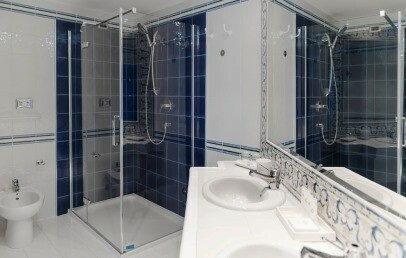 Some Standard rooms are equipped for disabled people. The Hotel Abi d'Oru boasts direct access to a beach of fine white sand. An area is reserved and equipped for the guests. - the 1st and 2nd rows can be booked for a fee (on-site) from 15.6 to 15.9, while they are free until 15.06 and after 15.09. VIP beach service for guests of the Presidential Suites: Gazebo with loungers and umbrella, mineral water, fresh fruit served during the day, dedicated waiter service. This part of sea is particularly suitable for children, due to its shallow and sandy waters. The new wellness centre has common areas and a Private Spa with exclusive services. The Spa offers a sauna, a Turkish steam bath, two showers for chromotherapy, an ice fountain, a relax area with salt walls, three treatment rooms. Various beauty and body treatments as well as massages are offered. Herbal teas are served in the internal relaxation area and the outdoor sun terrace, in front of the swimming pool, is ideal for relaxing and sunbathing. The Private Spa has a sauna, steam bath, loungers and relaxation area, private garden with whirlpool and romantic gazebo. The Private Spa is ideal for all those who would like to be pampered in private and also enjoy an aperitif while relaxing in the Jacuzzi. Services for children are numerous: a dedicated staff organized, six days a week, various activities during the day. The Mini Club is available (from 15 June to 15 September) for children aged 4 to 10 years. They can also have fun in the children pool. Centrale is the main restaurant and offers only buffet and show cooking. Here you can enjoy precious moments thanks to the breathtaking views from its terraces. In a corner of the terrace of the Restaurant “Centrale”, with the most beautiful panorama view, is the à la carte Gourmet Bellavista Restaurant, offering refined international cuisine. Dining at the Gourmet Restaurant is with extra charge, excluded from the half-board price. The typical Sardinian restaurant offers a degustation menu and table service, open for dinner and located by the poolside. This restaurant is excluded from the half-board price. The restaurant Marinella is open most of the time during the season (at management's discretion) and located directly by the sea. It is open for lunch with buffet and for dinner with à la carte menu. This restaurant is excluded from the half-board price. The restaurant Snack Bar Il Marinaio is also located directly on the beach and open only for lunch, it is ideal for casual and fast meals or salads or to enjoy a good pizza in front of the sea. The opening dates of the restaurants are at management's discretion. Hotel guests are offered elegant freshwater pool with Jacuzzi, two tennis courts with night lighting, a volleyball court, a fitness area. Moreover, there is the possibility of tennis lessons, diving, surfing and sailing, rent cars, motorbikes and bicycles. On the beach several canoes and boats can be rented. For golf lovers, the Pevero Golf Club is located about 20 km from the Hotel Abi d'Oru. The hotel facilities are various: parking, nurse service, laundry, shuttle service to Porto Rotondo, the evening entertainment with piano bar for relaxing moments at the end of the day. Free Wi-Fi internet access available throughout the entire hotel, including by he swimming pool and at the beach. The outdoor pool will be heated during cold days (at Management discretion and varies according to weather forecast). From mid-May to mid-October a newsagent/bazaar will be a convenience for the guests, where one can buy newspapers, souvenirs, postcards and various kinds of objects. City tax – € 4.00 per person/overnight, for a maximum of 7 consecutive overnights. Children/youth under 16 years are exempted and the tax has to be paid on-site. Pets allowed (not in the common areas), on request; price € 30,00/night (max. 7 kg). The Junior Suites are open space accommodations with sleeping corner and living corner. 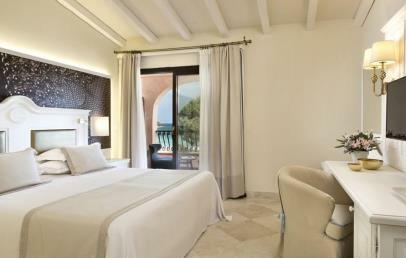 Comfortable Junior Suites furnished in a modern Sardinian style with warm colours. The bathroom has shower, hair dryer, bathrobes, complimentary toiletries, beach towels. They have an equipped terrace with wonderful view over the sea, only one Junior Suite has a patio. On request, it is possible to add a third bed or a cot. The Junior Suite have a max. occupancy of 3 people or max. 4 people. The room pictures are only representative of this room type; no guarantee to receive the room of this published picture. Spacious and nice Suites, furnished in the typical Sardinian style with warm colours. They have two separate rooms: the bedroom and the living room with french bed 140x180. The 2 bathrooms have a shower, hair dryer, bathrobes, courtesy set, beach towels. The Family Classic have a small terrace with partial sea view. Comfortable rooms, furnished in a modern Sardinian style with warm colours. The Standard rooms have a small balcony with hill, garden or lateral sea view. The bathroom has shower, hair dryer, bathrobes, complimentary toiletries, beach towels. Some rooms have the possibility to add a third bed or a cot (on request). Comfortable rooms, furnished in a modern Sardinian style with warm colours. The bathroom has shower, hair dryer, bathrobes, complimentary toiletries, beach towels. The rooms have a balcony with frontal sea view or a patio with direct access to the garden with sea view. Some rooms have the possibility to add a baby cot (on request). 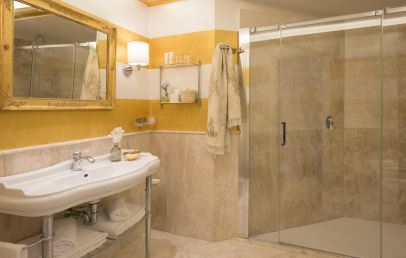 Completely renovated, they offer a modern elegant style melt with Sardinian tradition. They are on the upper floors and have balcony with sea view. The bathroom has shower, hair dryer, bathrobes, complimentary toiletries, beach towels.